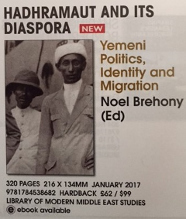 Muhammad Bin-Dohry will provide an overview of the HRC and Noel Brehony will go on to introduce the book, he will speak briefly about the chapters of authors who are unable to attend the launch and will acknowledge the contribution by the late John Shipman to the editing of the book. William Clarence-Smith, Thanos Petouris, Helen Lackner and James Spencer will then discuss their contributions to the book. The book will be offered at a special reduced price at the launch. It will also be produced in electronic version at a reduced price.